Did you know? What makes the Sonix SEO-friendly media player different from other media players? Search engines like Google don’t index audio & video nearly as well as they do text. Using Sonix’s automated transcription engine + the Sonix SEO-friendly media player allows your audio & video content to get found much easier. Analytics: Track where in transcript people drop off Coming soon! Analytics: Track most listened sections & hotspots Coming soon! Analytics: Track where audio or video is shared Coming soon! New to Sonix? Click here to get 30 minutes of free transcription! If you have highly sensitive information within your audio or videos that need transcription, you’ll undoubtedly be concerned about security of those files. While Sonix uses all the latest security protocols to ensure your data is safe & secure, we are unlike traditional transcription services since we transcribe your files entirely with machines. No human ever sees the transcript so you can rest assured that your content is private. We’re committed to the security of your files and provide multiple layers of protection for the data you entrust to Sonix. We build privacy into everything we do. It’s not an afterthought. It’s how we choose to treat, and respect, our customers on a daily basis. Voice-over sessions are great because you can build a lot of content all at the same time. The production of the voice-overs is more efficient this way, there’s no doubt about that. But what is really challenging is locating those voice-overs after the fact. Searching through your audio can be time-consuming. Wouldn’t it be easier if you could search your voice-overs by keyword or phrase? Well you can do that using Sonix. Just upload your voice-over file to Sonix and you’ll get a transcript in a couple of minutes. Once you have that, you can easily import the transcript and it will automagically align with your voice-over audio. Now you can search by word to locate the snippet you want. In this video Mike Russell goes through the mechanics of making voice-overs easily searchable. Want 30 minutes of free transcription? Click here to get it. Did you know? Is automated transcription better than human transcription? Is automated transcription better than human transcription? Automated transcription is much faster and much less expensive than human transcription. If getting a transcription fast and inexpensively is important to you, then automated transcription is likely better for you. However, automated transcription can be less accurate than human transcription. If you need 100% accuracy on your transcription, then human transcription is likely better for you. How much faster is automated transcription than human transcription? Automated transcription is much faster than human transcription. Automated transcription services provide transcriptions in minutes, not days. A typical turnaround time for a 30 minute audio or video file is 5 minutes for automated transcription services. For human transcription, that same file could take 2 or 3 days. How much less expensive is automated transcription versus human transcription? Automated is considerably less expensive than human transcription. Automated services typically charge roughly $5 to $10 per hour whereas human transcription services will cost anywhere from $60 to $200 per hour depending on the nature of the audio or video file. What is an example of a top rated automated transcription service? Sonix.ai was ranked highest in terms of accuracy by an independent study from PopUpPodcasting recently updated in December 20171. Did you know? What is the fastest way to get transcription for my audio or video? What is the fastest way to get transcription? The fastest way to get transcription for your audio or video is through an automated transcription service. Why is automated transcription so fast? Automated transcription is fast because the process to convert audio into text is done entirely by machines. The technology that powers these machines can process large amounts of data very quickly. How long does it take for a file to be transcribed with automated transcription? The length of time depends on the length of your audio or video file. For a 30 minute file, the typical turnaround time is roughly 5 minutes. For an hour-long file, the typical turnaround time is roughly 10 minutes. Automated transcription is basically on par with human transcription. However, audio and video files that are poorly recorded, have lots of background noise, or have people talking over each other will likely not be transcribed as accurately as a human transcriptionist. Did you know? What is the cheapest way to get transcription for my audio or video? What is the cheapest way to get transcription? The cheapest and fastest way to get transcription for your audio or video is through an automated transcription service. How much does it cost for automated transcription? Automated transcription costs range from 8 cents per minute to 25 cents per minute. 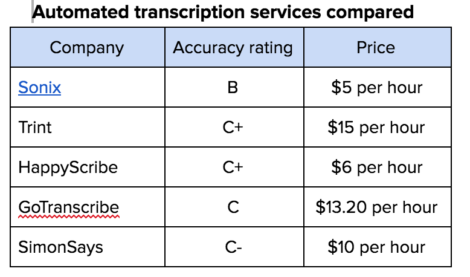 Why is automated transcription so cheap? Automated transcription is inexpensive because there are no humans involved. The whole process is done by machines. How long does automated transcription take? It depends on the length of your audio or video file. If you have a 30 minute audio or video file, the typical turnaround time would be 5 minutes. Automated transcription has made considerable strides in the last two years. Accuracy rates are now similar to human transcriptionists so long as the audio or video files are of high quality. Did you know? What is the best way transcribe my audio or video? What is the best way to transcribe audio or video? The best way to transcribe your audio or video depends on your needs. If you need transcription fast and cheap, then an automated transcription service is probably best. If you need 100% accuracy then a human transcription services might be best for you. Why is automated transcription so fast and cheap? Automated transcription is fast and cheap because it’s a fully automated process. Once you upload a file to an automated service, the whole process is handled by machines. Depending on the quality of your audio or video file, automated transcription accuracy rates are now at parity with human transcription.